The Royal Palace of Portici was built by King Charles. In 1737, during a storm, the royal couple had to stop in Portici; Queen Maria Amalia immediately liked the place and the King had the idea of building there a royal residence, which later became an official Royal Palace. The work began in 1738, under the lead of Medrano first and then Antonio Canevari, with a final intervention by Vanvitelli and Fuga. King Charles purchased the surrounding areas to transform them into a park and he also purchased the villas owned by the Earl of Palena and the prince of Santobuono, that will be then included into the new building. 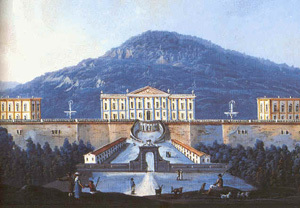 In 1740 a decision was taken to extend the site towards the sea by purchasing the wood owned by the d’Aquino Caramanico family, the palace of the Mascabruno family and the palace owned by the prince of Elboeuf. It was long believed that the Palace had been designed and realised on the base of the preexisting villas purchased by king Charles. Today, however, after a careful reading of the old design proposals not accepted by the sovereign because to realise them the royal road would have to be moved, scholars find reasons for the peculiar building of this royal palace not in architectural issues but in political and social issues: King Charles wanted to “experiment a new type of building which had to embody outside the idea of a “benevolent monarchy” that could make the people feel as physically and materially closer to the sovereign” (Barbera). Originally designed as summer residence of the Court, the Royal Palace then became royal residence and the seat of the Herculaneum Museum wanted by King Charles to exhibit the objects excavated at Herculaneum (and therefore Portici became one of the destinations of the Grand Tour). 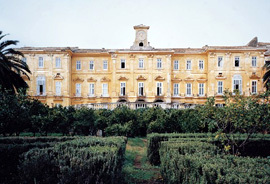 Once the work completed in 1742, however, the Palace showed to be not big enough to house the entire Court and therefore many noble families purchased or built villas in the surrounding neighbourhoods to be close to the sovereigns and thus created the characteristic artistic heritage present now in the area and known as “Vesuvian Villas”. The Palace has a superb facade with wide terraces and balustrades, and it is formed by an upper part and a lower part divided by a vast yard crossed by the old “Royal Road of Calabria”, presently called University Avenue. The entrance hall leads to the first floor through a magnificent staircase along which there are statues coming from Herculaneum; also the floors of some rooms were realised by using mosaics coming from the excavations of Vesuvian cities. At the first floor, we find the Hall of the Guards and the Hall of the Throne, which still have part of the original decorations; an office in Louis XV style and an office in the Chinese style both with floors from Herculaneum. Among the most precious realisations, we mention the porcelain drawing room of Queen Maria Amalia, an extraordinary example of the perfection achieved by the Royal Porcelain Factory of Capodimonte: this drawing room is presently exhibited at the Capodimonte Museum in Naples. Also the wonderful baroque chapel keeps two red marble columns used to realise the altar and coming from the stage of the theatre in Herculaneum. As for the Royal Palace of Caserta, here, too, the park is one of the Palace wonders: it is an English-style garden sloping down towards the sea, characterised by long alleys. The Fountain of Mermaids is a remarkable work of art, as well as the statue coming from an excavation and representing “Victory”, King Charles’ “Kiosk” with a mosaic embodied in a table, the Fountain of Swans and the statue of “Flora”, this one too coming from an excavation; there is also an amphitheatre with three orders of stairs. Another interesting place is the area dedicated to “ball games” or “fortification game”, destined to house an ancient type of sport now disappeared, similar to the Spanish pelota. Beyond the garden, the wood stretched out, realised according the typical attractions for court leisure: a yard for ball games, a fortified square for military exercises, a pheasant farm, etc. A zoo housing exotic animals was added in 1742. The elephant given to King Charles by Sultan Mahmud was put there and for this animal a leaflet entitled “Dissertation of the Elephant” was published in 1766.